I write this letter to you as someone who is deeply disturbed by your stance on the conflict between Israel and the Palestinians. If I am to take you on your word, something I certainly hope is feasible due to the fact that you are a Jewish man with ties to Israel, your feelings about Israel’s right to exist are not at issue here. What is at issue is your approach, an approach that not only feeds directly into those that wish to see Israel destroyed, but also puts not only Israel but the Jewish people worldwide in even greater danger than the one that exists today. To be frank Senator Sanders, I find your words to be not only damaging but terribly irresponsible. I have been following the election with great interest and have listened to as many of your speeches and soundbites as possible. I understand that like Donald Trump, you are appealing to a populist movement of disenchanted, angry and concerned voters. You are clearly a very intelligent and savvy politician. I am certain that you understand that your words, even if only soundbites, influence a great number of people. Therefore you must understand that more of your followers are likely to remember the 10,000 number you blurted out, the number of Palestinian deaths you said that Israel was responsible for in the last war in Gaza, than they will your insistence that Israel has the right to exist in freedom and security. They will take your words and see Israel as the guilty party in the conflict, subsequently making the terrorist organization Hamas, a group very similar to ISIS in their violent and ambitious tactics, as the defenders of the freedoms and rights of the Palestinians. Just as Donald Trump’s comments on Muslims and Mexicans create a perception of all Muslims and Mexicans by many of his supporters, your comments will have the same impact on many of your supporters towards Israel and the Jewish people. As a smart man I am sure you are aware of the fact that modern day anti-Israel sentiment has translated into a rise in worldwide anti-Semitism. “whenever I speak to audiences about the Middle East, sometimes audiences very hostile to Israel, I issue one challenge. Name a single country in the history of the world, faced with threats comparable to the threats faced by Israel, that has ever had a better record of human-rights, a better record of concern for civilians, a better record towards the sensitivity of legal issues and the rule of law. In a 100 speeches in which I issued that challenge, no one has ever come up with a country that has a better record than Israel faced with comparable threats”. Even if this is a miscalculation or ignorance on your part rather than a cynical attempt to pander to an audience you feel you need to win elections, your words are still damaging. I watched the few minutes with Jake Tapper of CNN in which you discussed this issue and was quite honestly startled by how you shrugged off what you referred to as your question of whether or not it was 10,000 people killed in Gaza as not being a big deal. Senator Sanders, it is a very big deal. Hamas, the terrorist organization that espouses the very same stance you take of “disproportionate response” by Israel and uses it as justification to murder women and children in the streets of Israel without remorse, does so with a claim that Israel was responsible for the deaths of less than 2,000. Well congratulations Senator, you just increased their justification more than five fold. After all, if an American presidential candidate and a Jew from Brooklyn wonders if it was 10,000 people, Hamas might not only be correct, they might be understating the number. What makes this worse is the fact that you would say that Israel is responsible for these deaths in the first place. I am far more open minded than you might think. I recognize the fact that Israel does things wrong and needs to work hard at changing the conditions of the Palestinians in the West Bank and Gaza. What I also recognize however is that the main obstacle in making these changes is not the Israeli government but the terrorist groups running the show in these territories. Millions upon millions of dollars have been squandered and stolen from the Palestinian people, not by the Israeli government but by the very people who claim to want to lead them to a better life. In truth, these people, the very same people you have empowered with your words, are cynical and devious criminals more concerned about Israel’s destruction and their personal lot than they are about the well-being of their population. Someone recently made the argument to me that as a Jew you need to overcompensate in order to not seem too biased on the side of Israel. Even if I do believe that is what you were doing, the question that needs to be asked is, at what cost? Your words mean something. If you want to be the leader of the free world, why would you take the side of an organization that not only wants to destroy the freedom of the people of your origin, but obstruct the freedom of their own? If it is to increase support among your constituency, you are going against the very thing you base your entire campaign on, a different kind of politics. If you want to be a true leader, a leader that guides the country and the youth of America to a better future, I urge you to first recognize the responsibility you have towards clearly distinguishing between right and wrong. That Senator Sanders is indeed a very big deal. As someone who has to at least some extent defended and supported you in the past, I can’t begin to tell you how disappointed I am with what you have done. I haven’t listened to everything you’ve always said, but as someone who is comfortable with your personal choices and as someone who enjoys hearing someone give an exuberant opinion, I have at the very least been a borderline fan. However, this time you crossed over from exuberance to idiocy, and as a result you are now hearing from me. Here’s the thing Rosie. As someone who opines on a regular basis I understand that in doing so I open myself up for criticism if and when I do or say something wrong. Subsequently it takes a degree of confidence in one’s ethical approach to choose to be a voice. Over the years you have been one VERY loud voice. In doing so however, you’ve also reached a point where you are required to be responsible. Many people have paid attention to at least some of what you have said, and many continue to listen to you. To be very blunt, I hope they stop doing so. Any credibility you may have had in my eyes, is now gone. And here is why. This is wrong on so many levels that I am almost embarrassed to say I once liked you. Your Limited Edition Acrylic Artwork designed and drawn by Rosie is one, everything people legitimately criticize about Americans. Two, so incredibly irresponsible in its inaccuracy. And three, so focused on putting down Israel it is downright gross, not to mention offensive. I will break it down for you. You have a picture of a man holding a wounded baby and you write, “Israel beings bombing Gaza-This man carries a baby about the same age as the one I sit next to, watching Frozen”. CLICK HERE TO SEE. Rosie, I love America. Even when I disagree with the government or see stupidity that can be interpreted as indigenous to our society, I am proud to be an American. Those who criticize Americans will say that we commercialize everything and often do so in shallow and ignorant fashion. I suspect that many will use your “art” as a prime example of this shallow ignorance. Then again, if they are haters of Israel and the Jews they will gravitate to it, because shallow stupidity is forgivable when done to put down Israel and the Jewish people. That’s not even the biggest problem with all of this Rosie. That picture wasn’t taken in Gaza and this man is not holding a baby wounded in an Israeli attack. This is the aftermath of a Syrian government attack on its own people. An attack that is just one of many in a civil war that has killed almost 200,000 people. Once again you show it is easier, and in some people’s minds hipper to attack Israel than to go after the real evil. On a side, but rather mind-boggling note, maybe you can answer this question for me. Why on earth would someone who has fought hard for the rights of the LGBT community go after the one government in the entire Middle East where gays and lesbians are allowed to live freely and without persecution? Not to mention the fact that you did so in such blatantly inaccurate fashion. 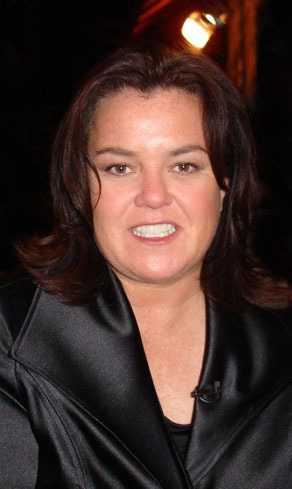 I want an apology Rosie. I want one for the entire Jewish community and I want one for the State of Israel. If we do not get one from you, your integrity is gone for good. You’ve always been a loud voice and one who has always claimed to be a straight shooter. Well in this case you are shooting wildly, inaccurately, and with a mean and subtle venom. I want an apology and a retraction. Anything short of this will show you to be part of the very hypocrisy you’ve always claimed to fight against. Do the right thing or stop talking, because if you don’t, you’re just another dumb voice without any substance.